Vision Zero, a road safety project that took birth in Sweden (and was adopted by the Swedish Parliament in October 1997), is based on the intention of zero fatality or serious injury on the road. The vision, now gaining importance the world over, is based on the principle that life and health are non-exchangeable with any other benefit. Hence, it is based on the premise that no monetary value can be placed on life and health to evaluate benefit-cost ratio on the basis of which money can be invested in the road network to decrease risk factor. The Vision Zero policy requires a significant reduction in the road deaths and injuries by 2020. All new roads are being built keeping this in mind and the older roads are being modified. According to World Health Organisation (WHO), the traffic safety situation will continue to worsen in the coming years. It estimates road fatality to be the fifth most common cause of deaths by 2030. With the issue of road safety thus becoming a strong objective for many countries, they are trying their best to frame stringent road safety laws. That has, in effect, brought pressure on vehicle manufacturers who are spending millions of dollars on research and innovation in safe technology. This is why Zero Vision gains significance. Sweden, known for its ambitious safety targets, is quite ahead of many countries when it comes to framing stringent policies on traffic safety management. The Swedish Transport Administration’s proposal of creating a Vision Zero Academy stems from this policy. The Academy, which aims at fructifying the vision, will be a public entity “that will combine private goods, common goods and commercial gains” and facilitate Sweden’s traffic safety targets and innovation-oriented product and service industry. 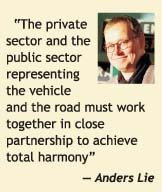 Anders Lie, Project Leader for the Vision Zero Academy of the Traffic Safety Division, (Swedish Transport Administration) feels that innovation and penetration must be guided to solve the right problems in the right way where norms, strategies and technologies are united and all relevant stakeholders must be included in the process. The Vision Zero Academy is aimed at gathering and building knowledge about the implementation processes and disseminating this knowledge to the stakeholders worldwide. It is also intended to give guidance on solving problems through innovation and penetration by integrating norms, strategies and technologies. Mobility, it says, cannot be gained at the expense of safety. Hence, it becomes a function of safety. Integrated road safety depends on a deep sense of learning of the exact and stepwise reasons that might lead to an accident which, in turn, would lead to fatality or a serious injury. Cognition, motoric response and attention play a significant role in this process, says Lie. That is why infrastructure design principles and other areas of traffic engineering will form an important base for the academy to lay its principles on. This will, in turn, lead to a change in present rules to facilitate the adoption of newer technology. The academy will owe its success to a strong cooperation from the automotive industry, the private service providers and the public sector. Vision Zero is not a time-bound target. Rather, it is the initiation of bringing about a change in the traditional perspectives of reducing present problems to dispensing guidance on the ideal state of the road transport system. What it does is provide a vision for a safe road transport system based on right strategies; and setting up of goals once that has been decided. By this, the responsibility of road will take a paradigm shift – from the road user to the joint sharing by the system designers and the road user. That would mean the designers will be held responsible for the level of safety of the system vis-a-vis design, operation and use of the road transport system; road users will be responsible for following the rules set by the designers and in case of a serious injury or fatality due to the user not following the rule owing to lack of knowledge, acceptance or ability, the system designers will take necessary steps to counter the affected people. The Academy will focus on three dominating trends for the overall approach of road safety. They are: The countries and other stakeholders are setting targets and trying to manage improvements by measuring progress over time to stimulate further actions; actions are expected from all stakeholders, including industry and private enterprise as they are collectively expected to contribute to a better road transport system through responsibility from social, environmental and work related perspectives; and, the migration of safety actions into vehicles of the future. As technology proves its prowess on the roads today through various innovations, the vision is driven mainly by economical and technical forces and a natural progress as a result of the competition between manufacturers and in particular, car manufacturers, says Sweden’s Traffic Administration. Hence, Vision Zero Academy will focus on its mission through seminars and networking, studies on implementation trials, norms and attitudes and training programmes. The Academy is expecting a clear and strong support from the local governments in the area, and from local transport services and industry located nearby. Without this support, feels the Swedish Transport Administration, the credibility of the academy might be questioned. Though initially the Swedish Transport Administration will be the main coordinator of the Academy, it is being planned to establish an advisory board for running it in the future.